Here is everything you need to know on what to learn in Chinese and who to learn Chinese language from. So, the first mistake we usually make while learning a new language is that we jump to try to read the words and try to memorize what we read – this technique only sets you up for failure. The best way to familiarize yourself with a new language is by listening to it. All you need to do is open up a few YouTube videos and open your mind to the language. Keep listening to the words, the pronunciations, and the sentences. Start with basic phrases. You can also use Pinyin, a phonetic writing system. This way you can begin writing down what you are hearing, and that would help you remember faster and better. It makes more sense right? What does not make sense is trying to remember characters that you have no sense about, such as what they sound like, etc. At first, it might sound like an impossible task to you and too fast. At times you won’t be able to keep up with it, but slowly your brain will get used to the sounds and start making sense of it and that I when your learning process will begin. Try listening to some catchy phrases that will get stuck in your head, and you’ll remember the meaning too. So, the first thing you should do is start the listening activities. Now, this is an important aspect of what to learn in Chinese. 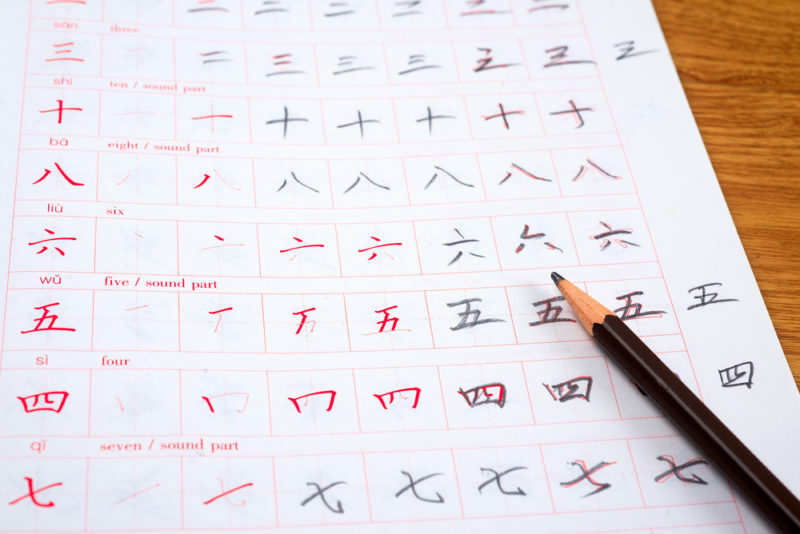 Studying Chinese characters is hard and takes quite some time, which is why it is necessary to memorize them every day. These characters are something you will learn and forget almost as quickly. You will need to read them every day for quite some time in order to get them to stick. Who to learn Chinese language from? Well, you can use Anki, which is a modern computer-based learning system. Over time it becomes easy to learn the characters because they are repeated a lot. Simply, hearing them for a while can help you get used to them, and soon enough you will be able to recognize them and understand them quicker and better. So, the secret to better learning is consistency and hard work. Don’t try too hard when it comes to reading. Focus on what is easier and what is recurring. You can check out the Intermediate Reader, which is a book on modern Chinese and introduces recurring patterns in every lesson that will help you know how the Chinese language works. One of the nice things about the Chinese language is that it has no complicated grammar. There are no punctuations or gender, verb aspects or junctions. So, it is better to focus on Chinese patterns rather than English. Now, to fully carry out this part of your learning you will have to continually write down patterns, memorize them, say them out loud and try to use these patterns when you speak. Another vital tip to learning Chinese is that no amount of reading is enough, which means that no matter how much you think you read, it probably is not enough. So, you should read more and more and not just textbooks. Read anything written in Chinese whether it is magazines, special paper on interesting topics or comics. Anything that would attract your attention is worth the read, and that is one of the ways through which you can master the Chinese language. This will help you polish your Chinese more over time and with daily practice, it will open your mind and make you sharper every time you read or hear something in Chinese. In today’s time, it is so much easier to get your hands on books or paper written in another language. Simply log on to the internet and grab whatever interests you. One of the most challenging aspects of this language is the different tones and accents it requires so that a native to understand you, which is why it is important to focus on listening. That is the only way to familiarize your brain with the sentences, the sentence structures, and pronunciations. Try to get audios of whatever you are reading and match it with how you read it out loud. Keep repeating after it, and that will help your speaking skills. Every character has a different tone, and it is easy to forget it when you are speaking, which is why it is important to memorize the tones with phrases. Listening to comprehension helps to internalize the tones of the characters, and it is a great way to get the rhythm of the language. For this particular technique, you can use Xiang Sheng, 相声. The performers in it exaggerate the tone of the words, and it is an excellent way to recognize the tone. It is available online along with transcripts. Finally, for the last part of our lesson, one of the most important things that a Chinese language student can do is to incorporate the language in their daily routine frequently. Once you begin to speak the language even if it is a little broken at first. It will get better eventually, and you will automatically begin to fix your sentence structures. For someone, whose first language is English it won’t be difficult for them to make the sounds of Mandarin. The tones are the difficult bit. They require extensive practice, and you will have to talk out loud to yourself or others in order to get it right. Like I said before, you can pick a few catchy phrases, listen to them online and try repeating after them to get the tone right. Try recording yourself so that you know how you sound. This will help you get a better idea of whether your tone matches the tone of those characters spoken by a native. It’s not easy learning a new language especially Chinese language, which has 1000 characters. Learning anything requires hard work and effort. So, these were a few tips on how to learn the Chinese language. If you follow these tips religiously, you will be speaking Mandarin in no time. Just follow these steps and see the results in no time. Chinese or Arabic? What is harder to learn?